I love knowing that Wagadō is not only a small business, it was created by a woman and it’s made right here (in small batches) in Austin, Texas. 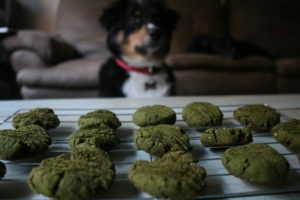 When I asked her about why she created Wagadō, she told me she wanted to create a unique bonding experience for dog parents everywhere that brought not only peace of mind, but wagging tails. Meet Wagadō! A healthy baking treat mix that all you have to do is add coconut (or veggie) oil + water. These treats have NO gluten, soy, or corn. Wagadō donates monthly to a local or national organization that helps dogs in need. Carnivore: Helps with bone + belly health and immune support. Full of beef liver, chicken breast, sweet potato, mushroom, beet, nutritional yeast, broccoli, + probiotics. Deep Sea: Helps with skin + coat, anti-inflammatory + belly health. Full of salmon, nori, spirulina, kelp, carrot, green-lipped mussel, sweet potato, ginger, + probiotics. Sweet Tooth: Helps with vitality, muscle function + belly health. Full of banana, whole oats, sweet potato, apple, honey powder, carob chips, + probiotics. Zen: Helps with detox, fresh breath + belly health. Full of mint, ginger, sweet potato, dandelion root, turmeric, spirulina, apple, honey powder + probiotics. As soon as they cooled enough, I gave one to Dawson who ate it immediately. He loved it and I can relax knowing that this treat is healthy for him. If you’re looking for a new treat mix, this is it! Be sure to follow Wagadō on Facebook, Instagram, + Twitter. WAGADō SENT ME TREAT MIX IN EXCHANGE FOR MY HONEST REVIEW. ALL OPINIONS ARE MY OWN.